The filter fits 6, 8 & 10 cup Chemex® Coffee Makers. Also fits Hario V60 02 & 03 coffee drippers. SUPER TASTY, YOU ARE INVITED TO TASTED THE DIFFERENCE!! ANTI BACTERIAL: Properties of hemp fibers prevent mold or bacteria growth. Hemp can kill the bacteriostatic in an hour, can control the bacterium of which cause the beriberi. CONE SHAPE: Comes 2 cone permanent in pack with 2-Ply of hemp fabric. Square shape coffee filters work great with Chemex® Coffee Makers pour-over brewers 6-12 Cups, Hario V60 03 Drip Coffee maker, Tanors Ceramic coffee cone coffee filters. NO UNPLEASANT ODOR: Cotton will have unpleasant odor from fabric after each washing. But never occurs in HEMP. According to the Hemp fiber properties, it helps to prevent mold and bacteria growth. EASY TO CLEAN: Before first use or Sterilizing: Boiling at least 5 minutes. After each use - rinse thoroughly with hot water. Then, hang it to be dried. No need to wring. FULL TASTE: Smoother tasting. Don't leave any icky or papery aftertaste in your coffee. More oil is allowed into the cup than paper filters. More oils means better taste! 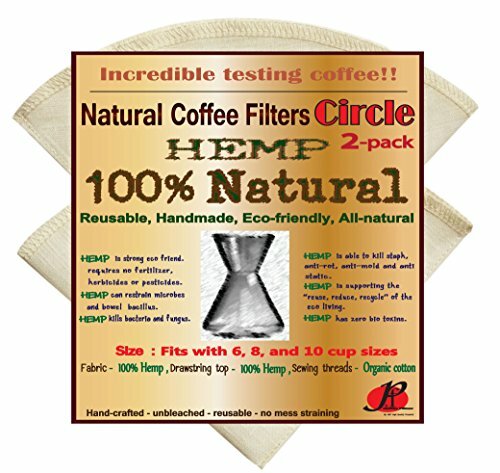 LONG LASTING: This natural reusable coffee filters will last many years (depending on the usage) with proper care. The most trustworthy as our nut milk bag. Items needed: Chemex®, coffee filter for Chemex® , Grinder, Pouring Kettle, Gram Scale & Timer. This is not a Chemex® OEM product and is not covered under any Chemex® manufacturer's warranty. The Chemex® brand names and logos are the registered trademarks of their respective owners. Any use of the Chemex® brand name or model designation for this product is made solely for purposes of demonstrating compatibility. Why's hemp?--Hemp has ZERO BIO TOXINS, requires no fertilizer, herbicides or pesticides like cotton. Hemp KILLS bacteria, staph and fungus. Hemp is anti-rot, anti-mold. Hemp can restrain microbes and bowel bacillus. Hemp fibers are grown and produced without the use of the harmful chemicals. If you have any questions about this product by P&F Coffee Filters, contact us by completing and submitting the form below. If you are looking for a specif part number, please include it with your message.